Marketing is recruiting’s next frontier. If you’re a marketer, you’re trying to generate a lead or a sale, so you dedicate a tremendous amount of time, energy, and expense to achieving the highest conversion rates possible. 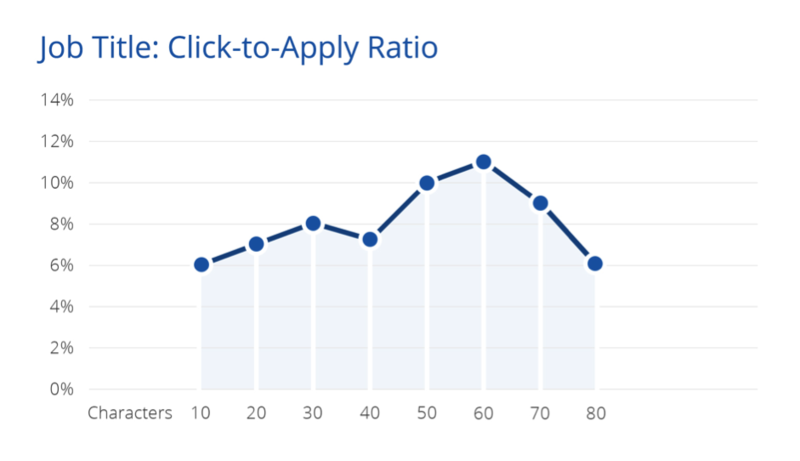 Similarly, you can maximize the return on investment of your recruitment campaigns when considering click-to-apply ratios. Click-to-apply tracks the number of candidates viewing a job advertisement who then go on to complete an application. We at Appcast.io recently tracked nearly 400,000 job seekers looking at job advertisements across various platforms and the 30,051 applications that resulted from those views. The data supports a “Goldilocks” logic when it comes to optimizing the ROI of job descriptions. Too-short job descriptions of 1,000 to 2,000 characters (170-250 words) returned a click-to-apply of just 6.7 percent. For job descriptions containing less than 1,000 characters, click-to-apply dropped to 3.0 percent. Too-long job descriptions over 10,000 characters (around 2,000 words) achieved a similar click-to-apply of 6.7 percent. Click-to-applies are up to five times higher for job descriptions between 2,000 to 10,000 characters. 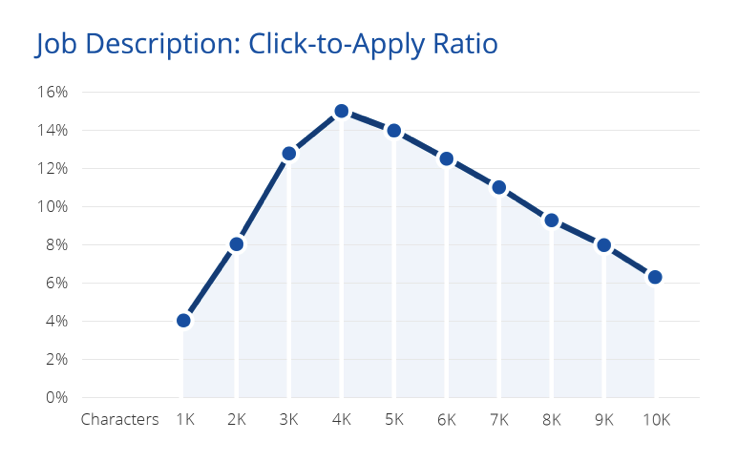 For descriptions between 4,000 and 5,000 characters, click-to-apply spikes at just under 15 percent. Too-short descriptions do not influence candidates who need sufficient context in order to make an application decision. Too-long job descriptions may suggest a stifling working environment and demand too much effort from candidates who already are investing a great deal of time in their job search. The “just right” description is detailed, without being too long, as the bell-curve shows. Appcast.io’s analysis also shows a clear ROI hot spot for titles containing 50-60 characters. Titles of this length outperform other titles by 30 to 40 percent. However, the overall data is murky. Very short job titles (less than 30 characters) and very long titles (80 characters or more) do not suffer the sharp click-to-apply drop off experienced by non-optimal job descriptions. So, while opportunities exist to optimize the length of job titles, clear and descriptive title content may have greater influence on a candidate’s decision to apply. 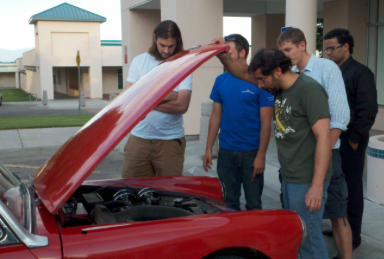 Lengthy, complex, and time-consuming applications act as a barrier to applicants. 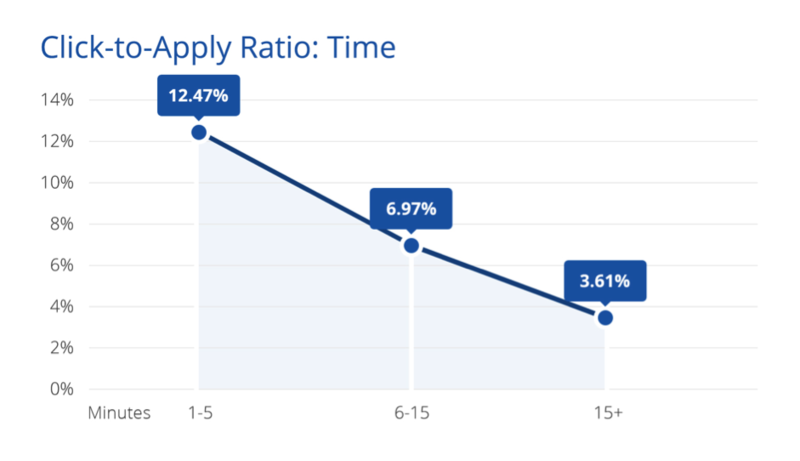 Candidates are 365 percent less likely to submit an application that takes more than 15 minutes to complete, as the chart below shows. On a cost-per-click recruitment advertisement pricing model, recruiters pay per click regardless of what the candidate does next. When completion rates are low, applicant sourcing costs are commensurately high. 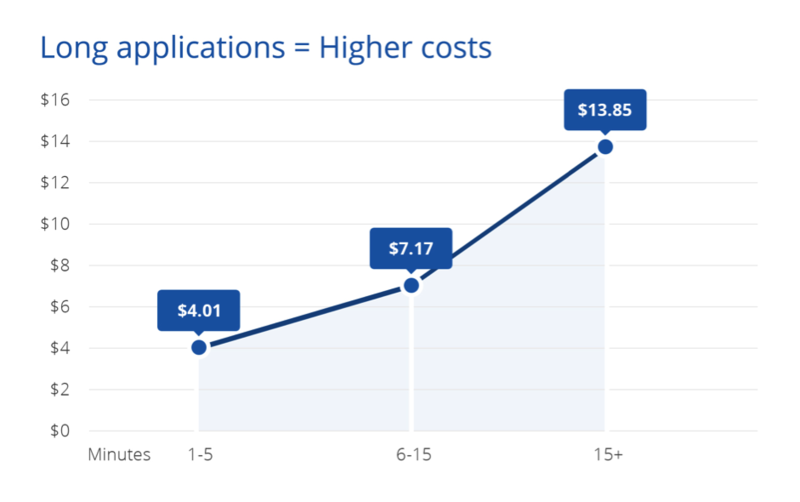 The data suggests that recruiters can slash their cost-per-applicant by 250 percent simply by reducing the time it takes to complete an application from 15 minutes to 5 minutes. Recruiters should think like online marketers to analyze their conversion path and boost recruitment ROI. By applying data-driven strategies to job postings and apply processes, recruiters can generate optimal interest in their advertisements, create leads, and compel a greater number of qualified candidates to toss their hat into the ring. The data indicates that job descriptions and titles should be “Goldilocks” length to maximize click-through rates, and suggests a built-in business case for streamlining the application process. Recruiters may benefit by analyzing their online application and removing every “nice-to-have” question that is not required to evaluate a candidate. The reality is that every superfluous question lengthens the process, deters applications, and costs money.